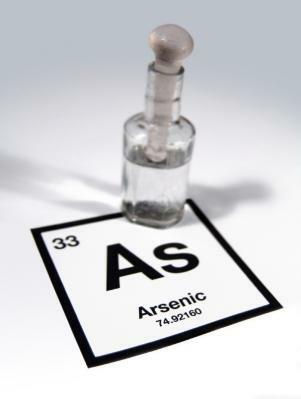 Arsenic poison has primarily been used as rat poison, though that hasn't stopped people from ingesting it as well. Arsenic has been found in many food items either accidentally or on purpose. Read on to find out what arsenic poison is, how to safely store this poison, and how to recognize the symptoms. Arsenic is considered one of the classic poisons. It enjoyed the height of popularity during the Middle Ages. Royal users used arsenic poison as a way to get rid of people who spoke negatively about them, or as a way to eliminate rivals. Princess Catherine de Medicis from Italy was particularly fond of this type of poison. When she went to France to marry Henry Deux, she used it to effectively end the life of the Dauphin Francois and the Cardinal of Lorraine. The poison was usually administered as a liquid (the powder was mixed with water) and several drops in a glass of wine or water could kill a person. Today, people may try to kill others using this form of poison. But with modern-day methods of detecting poisons in the blood stream, they are usually caught quickly. Arsenic is an element, which means it cannot be broken down further into any other chemical. It is also one of the most common of the 103 chemical elements. Arsenic can be found in a variety of household items from paint to pesticides. Traces of arsenic can be found in most human tissue because it can be found so often in the home. Arsenic most commonly is seen as a white powder, known as arsenic trioxide. In its natural state, it is found as a gray metal. Arsenic, a hazardous material, should always be stored in the container in which it was originally purchased. If the containers become damaged, an appropriate similar container must be used to store it and labeled again correctly. Never store the powdered form or arsenic or any other pesticide or insecticide in areas where water can be found. People can be exposed to arsenic by ingesting or inhaling arsenic powder. It may also be inhaled as arsine gas in the workplace. Symptoms may appear within a half-hour of being exposed to large amounts of the substance. Death can occur quickly, often within an hour, if the affected person is not treated promptly at a medical facility. If a person experiences any of these symptoms and is not treated, they may succumb to convulsions and a coma. The cause of death will be circulatory failure caused by arsenic poisoning. There are several methods used to treat someone who has been exposed to arsenic. Charcoal therapy is one of the first things used to absorb any arsenic laced liquids in a person's stomach. The charcoal is chewed and swallowed with water. The second method of treatment is pumping the stomach of the individual if ingestion occurred recently. The third method is chelation therapy. This involves giving a person chelating agents orally and sometimes intravenously to help eliminate heavy metals from their body. The heavy metals bind to the chelating agents and can then be excreted normally. Arsenic is commonly found in many workplaces and people's homes. The careful use and storage of this element in its' powdered form is important to prevent accidental ingestion or inhalation. Following the guidelines of proper use in the workplace from OSHA or the directions provided on the containers for household use will help people avoid unintentional poisoning. If poisoning is suspected, prompt medical attention is required to prevent permanent damage to the circulatory system and death.